After nearly two years of eating the free pizza provided by my school, one would think that I would be burned out on pizza. Fortunately, that is not the case because Pittsburgh just happens to have some amazing pizza places. Take for example, Dinette in East Liberty, which is by no means a new spot, but compared against the more classic Italian neighborhoods like Bloomfield it certainly seems new. The inside is like a mini diner, in which the menu consists of little more than pizza. Great Harvest is like the small mom and pop answer to Panera. It’s a franchise, but one that allows the owner to make the store truly unique. Take, for example, the Great Harvest that opened up in Pittsburgh’s East Liberty not too long ago. 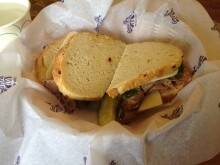 It features a bunch of local Pittsburgh food, plus sandwiches and breads chosen by the owner. And since the afternoon was ripe for a sandwich, Great Harvest seemed like a good place to be. Down in East Liberty, a fairly new pizza spot called Pizza Taglio has opened up to bring some unique new flavors to Pittsburgh. It claims to be Roman style, which I suppose is different from Napoli style, but not so different that it doesn’t involve dough, cheese and toppings. The place doesn’t do cups, so all drinks are bottled or canned, but it does do good music to somewhat make up for it. It’s like Jamaica and Mexico in one. EDIT: This location is extinct, but there’s another in Beechview if you want to go alllll the way out there. After two failed attempts to pay a visit to Casa Rasta due to inaccurate hours posted online, I finally made it there. I was expecting a quick in and out fast casual sort of place, but was surprised when I found it to be an eat-in sort of place instead. The menu was full of things I would have wanted to eat, but my stomach is only so big. In need of a quick bite, wandering the streets of East Liberty and craving pizza, Pizza Sola appeared ahead like a shiny beacon of hope. The place is pretty big, but seems to cater more to the pizza-by-the-slice crowd than to the dine-in types. 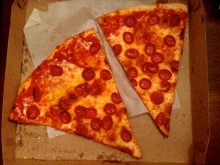 I was somewhat torn, but then when I saw just how big the slices were I felt fine with just grabbing a couple. Mine are the brown ones. In the year 1915, World War I was in full swing, women still couldn’t vote in our fine country and Thyphoid Mary was doing her thing. Oh and Station Street opened in Pittsburgh. But considering the place is run by local celeb chef Kevin Sousa, it’s safe to assume the place has changed. In fact, it even seems to have changed recently, adding street food like tacos and bibimbap (both of which probably didn’t exist in the Pittsburgh lexicon in 1915) to its list already extensive list of hot dogs. Just as with the band MGMT, I am never quite sure whether to pronounce BRGR as “B-R-G-R” or as “Burger.” Such is the conundrum of a word without vowels, but in truth pronunciation matters little in such a situation compared to how good the burgers are. To many people, there is a debate as to the merits of BRGR versus Burgatory. Having truly, madly and deeply enjoyed Burgatory, BRGR certainly had its work cut out for it. Perched on a corner in East Liberty is a fancy little spot called Spoon. Apparently it comes from the same people behind BRGR, which is supposed to have some pretty good burgers, but I haven’t gotten around to reviewing it yet. But, without knowing Spoon’s origins and simply taking a look at the fancy prices of the place, I decided to order their burger. I’m not sure a soul in the world exists that doesn’t like Mac and Cheese. Sure, some might not be able to eat it for lactose, gluten or (shudder) vegan reasons, but I am sure those people all still wish they could eat it. After all, it is quite possibly the ultimate comfort food. So when Pop City called out Kelly’s Bar & Lounge as Pittsburgh’s best mac and cheese (apparently a very poorly-kept secret), I made my way there as quickly as possible.